Uses: As a minor ore of copper and as mineral specimens. Enargite is a somewhat rare copper mineral. It does not often form well shaped crystals, but there are several localities that produce some fine enargite clusters. Its crystals that form tabular to blocky to prismatic forms are often pseudohexagonal, having six sides but not six identical sides. Twinning is common for enargite and can form a nice star shaped cyclic twin called a trilling. Enargite is related to the rare mineral wurtzite. 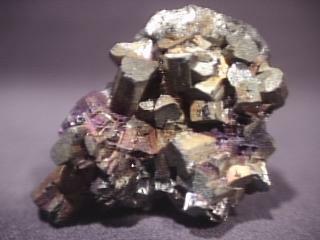 Wurtzite is a zinc sulfide with a formula of ZnS. In enargite 75% of the zinc atoms are replaced by copper and 25% of the zinc atoms are replaced by arsenic, Cu3AsS4. The similarity is easier to see if wurtzite's formula is rewritten as Zn4S4. The different elements however do not lend themselves to the exact same structure as wurtzite has a symmetry of hexagonal; 6 m m and enargite's symmetry is orthorhombic; 2 m m.
The symmetry of enargite is very uncommon. It belongs to a symmetry class that produced hemimorphic crystals and is typified by the mineral hemimorphite. The hemi means half while the morph means shape. General hemimorphic crystals can have differently shaped tops compared to the bottoms of the crystals. In enargite, the crystals do not have any unique terminations, just a flat face. The "bottom" of the crystals would have a flat face as well, but how do you tell one flat face from another? In the mineral hemimorphite, the top termination faces slant to a point and the bottom termination is much more blunted, a clear difference. Unfortunately for enargite its hemimorphic character is undetectable because of its crystal form. Color is gray to black. Crystal Habits include pseudohexagonal prismatic to blocky or tabular crystals, often terminated by a flat pedion face. Also found massive, granular and in radiating aggregates. Twinning is common and sometimes results in a star shaped cyclic twin called a trilling. Cleavage is perfect in two directions, prismatically; distinct in two other directions also prismatically but with different orientations. Other Characteristics: crystals are typically striated lengthwise and a tarnish will dull the luster of crystals over time. Associated Minerals are quartz, bornite, galena, sphalerite, tennantite, chalcocite, chalcopyrite, covellite, pyrite and other sulfides. Notable Occurrences include Butte, Montana, San Juan Mountains, Colorado and at both Bingham Canyon and Tintic, Utah, USA; Sonora, Mexico; Argentina; Chile; Morococha and Cerro de Pasco, Peru and Island of Luzon, Philippines. Best Field Indicators are crystal habit, streak, cleavage and associations.